FRP requires little maintenance and no repainting with minimal fading in a sunny environment. Lightweight materials saved the end user money because the installation costs of FRP are lower than steel products. Heavy maintenance and yearly preserving measures can help extend the life of wooden docks, but eventually traditional wooden docks become troublesome as they begin to splinter and rot after time in the outdoor elements. The customer was interested in constructing a boat dock with materials that would provide a long life cycle requiring virtually no maintenance and also blend with the beautiful natural surroundings. The dock was fabricated using Fibergrate's AquaGrate® pultruded T1210 grating and structural shapes as well as a ladder at the end of the dock. 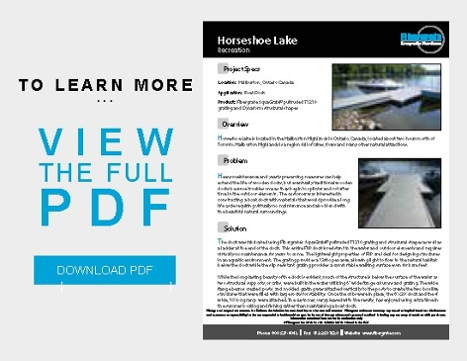 This entire FRP dock is resistant to the water and outdoor elements and requires virtually no maintenance for years to come. The lightweight properties of FRP are ideal for designing structures in an aquatic environment. The grating provides a 12% open area, allowing light to flow to the natural habitat below the dock while the slip-resistant grating provides a comfortable walking surface even for bare feet. While the long-lasting beauty of the dock is evident, much of the structure is below the surface of the water as two structural supports, or cribs, were built in the water utilizing 6" wide flange columns and grating. The wide flange beams created posts, and molded grating was attached vertically to the posts to create the two box-like structures that were filled with large rocks for stability. Once the cribs were in place, the 8' x 20' dock and the 4' wide, 10' long ramp were attached. The customer, very pleased with the results, has enjoyed using extra time in the summer boating and fishing rather than maintaining a boat dock.